Home NEWS CRH expands A&E Dept. 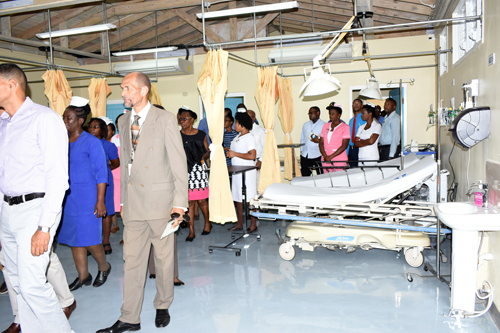 Stakeholders of the Cornwall Regional Hospital pour into the newly expanded unit of the Accident and Emergency Department. The expanded facility was revealed last Thursday in a ceremony held at the institution. Hospital users from St. James and its environs will now be able to benefit from a brand-new expansion of the Accident and Emergency (A&E) Department at the Cornwall Regional Hospital (CRH), which is a welcomed reprieve from the tent toward the back of the institution. The expansion comes in light of the major blow-up of the issues stemming from a lack of maintenance and accountability over the years, which saw the removal of the services from the main building being relocated toward the back of the hospital in recent months. And although the authorities implemented the safety gauze of utilizing the Mount Salem Clinic as a temporary A&E Department, this included inconveniences in the form of inadequate space and limited room space for minor surgery procedures wherein emergencies require immediate attention. The newly expanded department was revealed last week Thursday by the Ministry of Health and the Western Regional Health Authority in a hand-over ceremony held at the Cornwall Regional Hospital. The A&E Department should be benefiting from improved customer service as well, as with the expansion, health officials also revealed the launch of the Compassionate Care Programme (CCP). Apart from the health service that is provided at the institution, the CCP was designed specifically to improve the customer service experience of the patients. “We must deliver our service with compassion because compassion is therapeutic. When people believe you care about them, even when they’re in the midst of their emergency, they start to heal even from that point,” said Health Minister Dr. Christopher Tufton. Although construction has already been initiated, there was the ground-breaking for a stand-alone unit of the Radiology Department which was lead by members of the relevant health authorities. Completion of the construction will mitigate the expense of outsourcing which includes diagnostics costs that have recently amounted to an excess of $21 million, and CTC scans at private facilities which have amounted to $37.5 million. This is expected to be an economically viable option, and logistically, the stand-alone unit is conveniently erected next to the A&E Department, which is beneficial in terms of capacity and layout of the buildings. To combat the issue of bed space, it was announced that in a few weeks, there will be several additional beds catering to inpatient care outside of the main building. “Our biggest problem now is to provide bed space and I can assure you… we are in the process of providing 80 additional beds… to ease the congestion that we’re having there,” said Dr. Delroy Fray, Clinical Coordinator. Dr. Tufton outlined, however, that “This is not an unveiling of the new Cornwall Regional.” He highlighted that while they are cognizant of the need to expedite restoration of the main building, and are working toward achieving same, services have been taking place regardless.